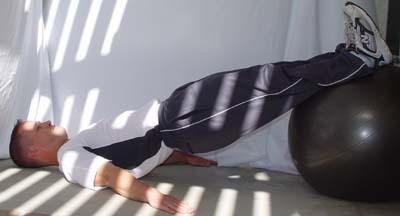 Start: Begin with the ball resting between your low back and a wall. 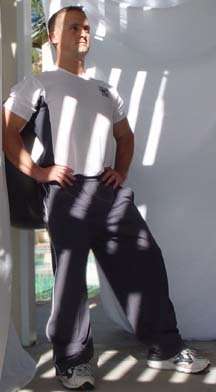 Walk your feet forward about 6 inches with your feet shoulder width apart. At this point you should be leaning against the ball. Finish: Slowly bend your knees and push your bottom back such that your knees stay directly on top of your ankles. Keep your abdominals tight the entire duration of the exercise. Start: Begin with one foot in the air, balancing against the ball. 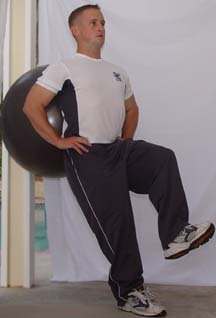 Finish: Keeping your abdominals drawn in, bend your supporting knee, allowing your bottom to lower. Be certain not to let your supporting knee go forward over your supporting foot. 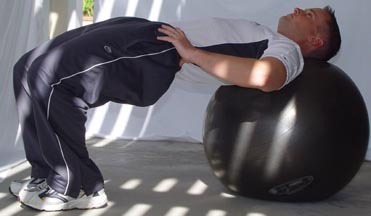 Start: Begin lying on your back with your ankles on the ball and your hands by your side. Middle: Elevate your body to make your body totally flat, keeping your feet flexed and abdominals drawn in. 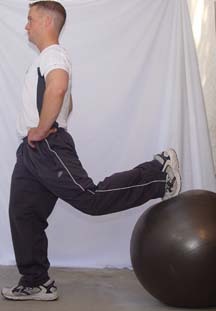 Finish: Curl your feet underneath your body, finishing with your heels on the ball, and feet still flexed. 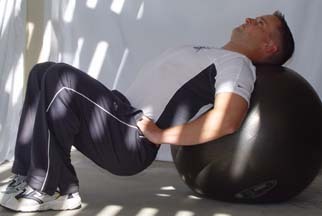 abdominals tightened the entire times. Start: Begin with one heel on the ball and one foot in the air. 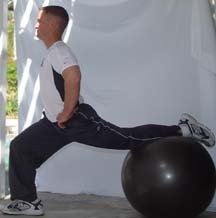 your body, keeping your abdominals drawn in the entire duration of the exercise. glutes, pushing your hips directly toward the ceiling. 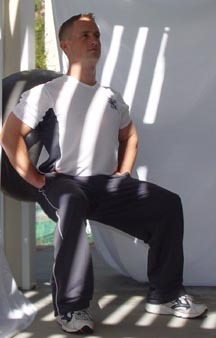 Keep your knees over your feet at a 90 degree knee angle. your hips in the air and return to the starting position. Start: Begin with your toe on the ball and your hands on your waist. 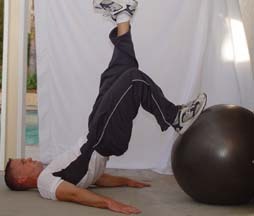 Start: Begin lying on your back with your feet flat against the ball and hands by your side. Finish: Keeping your abs tight, push your hips in the air, keeping your arms by your side to stabilize your body. 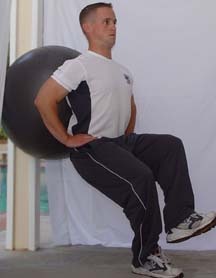 The ball should not move during this exercise. If this is difficult, you can brace the ball against a wall. Start: Begin with one foot on the ball and one foot in the air, with your low back an inch or so off of the ground. arms by your side to stabilize your body, and keep your abdominals drawn in the entire time.